The French diplomat and historian, Baron Félix de Beaujour (1765-1836), was born in Callas in Provence. He studied at Aix-en-Provence and Paris, joined the diplomatic service and served as French consul-general in Greece in 1794, in Washington in 1804-1811 and in Smyrna [Izmir] in 1816. His description of Albania, published in the two-volume book “Voyage militaire dans l’Empire Othoman” (Military Journey through the Ottoman Empire), Paris 1829, is primarily geographical, with an eye to military issues, but he also mentions the people of the country in the following excerpt. Albania is divided into two great pashaliks: that of Berat and that of Scoudari [Shkodra]. The former stretches from the Aoüs [Vjosa] River to the Genesus [Shkumbin] River. The latter stretches from the Genesus to Montenegro, but most of the inhabitants who live in these pashaliks, and who have various customs and religions, only obey the Turkish pashas when they are forced to do so. These different peoples have found in their mountains a refuge from oppression and they enjoy a sort of independence in European Turkey similar to that enjoyed by the Kurds and the Turkmen in Asian Turkey. When the Turks invaded Asia Minor and Greece, all the people who had the courage to resist them fled after the conquest, some into the mountains of the Caucasus and others into the mountains of Albania. Albania thus became an asylum for the most courageous people of European Turkey, just as the Caucasus became an asylum for the most courageous of Asian Turkey. These people brought to their new homeland their customs and habits, and lived independent of one another. They never mixed, and this is the cause of their, as yet imperfect state of civilisation. But this type of civilisation, that hindered their progress in the arts, promoted their warlike proclivities. As such, the Albanians are nowadays the best soldiers in European Turkey. They have the highest degree of force, agility and ardour, and all the other qualities needed by warriors. If they had the same training and discipline, they would be equal and perhaps superior to the best European troops. But since they live in an uncivilised country, they do not know how to make war with skill. They do so simply using their instinct, and can only fight small-scale battles well. No shooter is better at finding his target; no troop is better at choosing a defensive site, and defends it with such vigour. These advantages are compounded by the speed of their attacks on the enemy, and by their constant capacity to deceive their foes. Scattered, when they are on the retreat, they lay in ambush behind boulders or bushes, and when the terrain offers no suitable shelter, they dig holes in the ground in which they nestle. But when they attack, they all run forth together, and no troops can resist their élan. A Turkish (i.e. 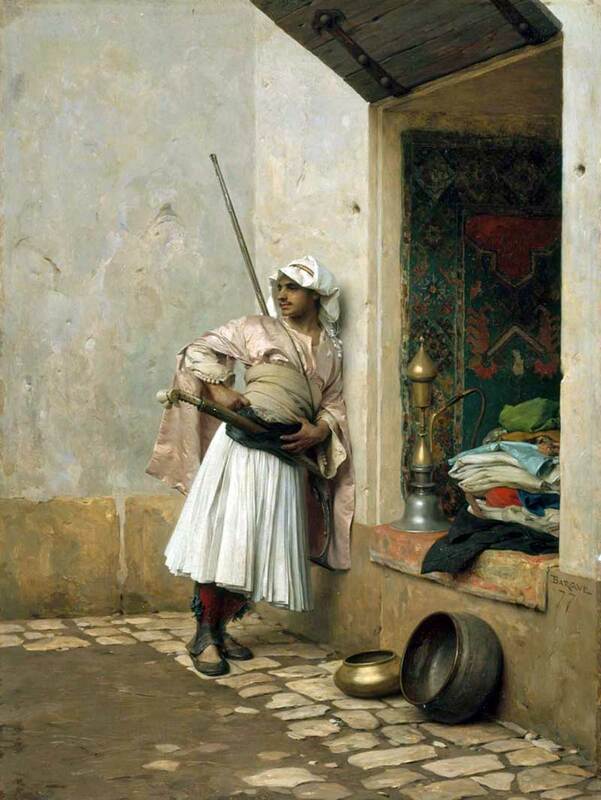 Albanian) Sentinel in Cairo, by Charles Bargue, 1877 (Museum of Fine Arts, Boston). The Albanians do not like sedentary work. They prefer the profession of warrior over all others. When they are not making war among themselves, they do so elsewhere, and hire themselves out to pashas in Turkey, as the Swiss hire themselves out to the princes of Europe. Foot soldiers are usually paid one sequin a month, and horsemen two sequin, both being allowed to loot and pillage the enemy. These soldiers are as valuable and as faithful as the Swiss, but do not subordinate themselves as well. They are the scourge of the towns and countryside. If you remember the bands of brigands, called Malandrins, that ravaged France at the time of Charles V, you will have an idea of what these Albanian soldiers are like. Their forces will one day conquer Turkey and cut it into pieces. It will perhaps be an Albanian soldier who overthrows the Ottoman throne. With its mountains, Albania resembles Switzerland and is much better defended by nature than by arms. As it can only be attacked from the sea, one would have to fortify the main points along the coast in order to defend it. These are, in particular, Dulcigno [Ulqin/Ulcinj], Alessio [Lezha], Durazzo [Durrës] and Apollonia. The former two are accessible from Manfredonia and Bari, and the latter two from Brindisi and Otranto. One would have to expand or fortify a line of defence for Scoudari, which provides access to the valleys of the Morača and the Drin. One would also have to repair Durazzo from where one can reach the plateau of Ochrida [Ohrid] along the Via Egnatia, and one would need to rebuild Apollonia, from where one can advance on Yanina [Ioannina] up the valleys of the Aoüs and the Celydnus [Drino]. Albania is to Greece what Lombardy is to Italy. Whoever wants to keep these two peninsulas, must occupy the head. This is why the Turks attach such importance to Albania and have always regarded it as an inroad to Greece.